Providing services to people who are blind and visually impaired since 1934. We are a North Carolina based, public non-profit agency that has provided services to blind and visually impaired people since 1934. Metrolina Association for the Blind became a member agency of United Way in 1938, an affiliation it continues to enjoy today. 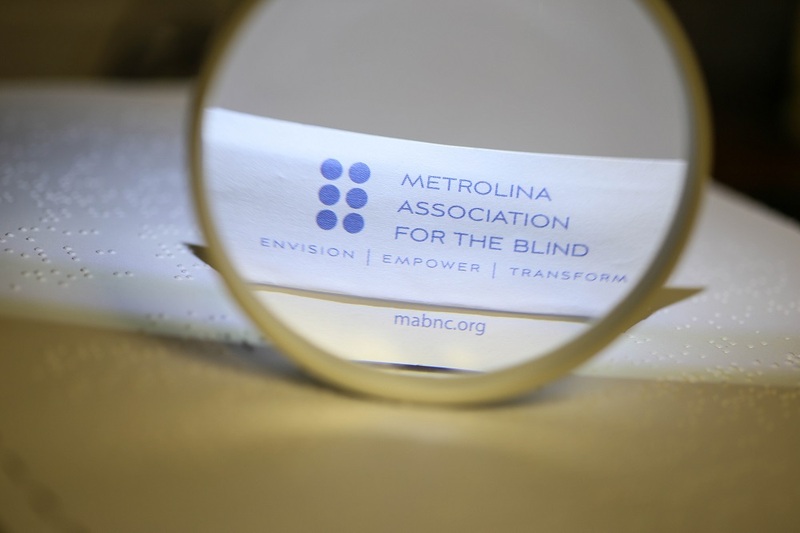 The Metrolina Association for the Blind provides two main services which are described below. These services help people who are blind and visually impaired learn techniques of daily living and ways to increase their independence. Rehabilitation specialists develop a personal relationship with every client in order to understand each person's unique needs and to implement a program tailored to the individual. We also provide support services such as an aids and appliances store, transportation, and individual counseling. ADS is our Braille, Large Print, Audio CD and Accessible PDF Department. Statement Rendering Services: We service more than 50 U.S. companies monthly by transcribing their monthly billing statements and custom documents into Braille, Large Print, Audio CD and Accessible PDF. Additional Transcription Services: We also transcribe other assorted items that include: insurance policies, annual reports, legal documents, employee orientation materials, voter ballots, menus, and personal letters. Textbook Mastering and Copy Services: Our costs to master textbooks in Braille or Large Print are competitive within the industry. The purpose of this policy is to indicate our concern about the privacy of employees and customers of MAB as well as to those visitors to http://www.mabnc.org. We recognize the importance of protecting personally identifiable information that you share with us. Personally identifiable information includes your name, address, e-mail address, and other information that may be specific to our relationship. The only time information is made available outside the Agency is cases where information has been condensed in aggregate form. This policy applies to all MAB employees, affiliates, and contractors. MAB is committed to protecting the privacy of our employees, customers and website visitors. Our relationship with these groups is valuable and we understand the importance you place on the privacy and security of information which personally identifies you. In that respect, and whether you are a first time visitor to our website or a regular user, a new employee or exiting one, or a long-time customer or vendor we take your privacy seriously. Learn more about our Vision Rehabilitation and Accessible Document Services and how to access them. Support our efforts to serve blind and visually impaired people by making donations on-line using your credit card. All credit card transactions are secure. Find a volunteer activity which appeals to you and submit your application to volunteer with us on-line. Gain information about our history. Get directions to our agency. Thank you for visiting our site. If we can assist you in any way simply contact us through email or by calling us at 1-800-926-5466. Enjoy your visit!